It Comes at Night, the new horror movie, reviewed. Like a Bruegel painting, this post-apocalyptic horror film portrays a bleak vision with a master’s touch. Joel Edgerton in It Comes at Night. As It Comes at Night begins, the disaster has already happened. This spare but savage horror movie, the second feature film from writer-director Trey Edward Shults (whose debut, the vertiginous addiction drama Krisha, made my 10-best list last year), takes place in the wake of some never-named catastrophe. Was the plague that seems to have killed off most of the Earth’s inhabitants triggered by war or environmental collapse? Did the world as we know it end with a bang or a whimper? With a reserve that’s rare in the era of elaborate world building, Shults never reveals the exact nature of this particular apocalypse. All that seems to be left as the film opens is one family, boarded up in what was once a lovely house in the woods. They venture outside only to chop firewood and fetch water, wearing gas masks to protect against the mysterious illness. The hypervigilant patriarch, Paul (Joel Edgerton), runs the house like a military camp. He’s a devoted husband and father, but having to battle the constant looming specter of death hasn’t done wonders for his parental warmth. His wife, Sarah (Carmen Ejogo), loses her own beloved father to the plague in the first scene, and Paul’s swift and unsentimental disposal of the body makes it clear he isn’t playing around when it comes to his family’s safety. Their 17-year-old son, Travis (the remarkable Kelvin Harrison Jr.), through whose expressive eyes much of the story unfolds, is as normal a teenager as a kid in a post-apocalyptic hellscape can be. He misses his grandfather, confides his secrets to his grandfather’s old dog, and dreams about, among other things, pretty girls—though Travis’ frequent dreams, filmed in rich chiaroscuro by cinematographer Drew Daniels, have a way of ending in stark images of body horror. One night the family’s home is broken into by a stranger named Will (Christopher Abbott), who, under rough questioning from Paul, claims he’s seeking water for his wife and small son living 50 miles away. Sarah convinces Paul that it makes sense to invite this family to take shelter with their own, not least because the newcomers have livestock and chickens to offer. Soon Will; his wife, Kim (Riley Keough); and their little boy, Andrew (Griffin Robert Faulkner), are adjusting to the rigid daily routine prescribed by Paul, who warily welcomes them while making clear that any breach of trust could be deadly. As relations between the two families grow more and more tense, the viewer, along with Travis, starts to question just what the point is of all this survivalist grit. What sort of life, Shults asks—not directly through dialogue but with the nimble movement of his camera and the merciless unfolding of his plot—would constitute one worth surviving for? Edgerton’s Paul embodies a type that at first seems familiar from countless action movies: the tough but loving dad willing to do anything to protect his family. But what happens when that family’s interests and needs come into direct, zero-sum conflict with those of another, equally deserving family? Human civilization is, at its core, an attempt to defer that brutal question into an indefinite future, to maintain at least the sustaining myth that we’re all in this together. The slowly building showdown between Paul and Will, two headstrong men determined to keep their loved ones safe at all costs, is a refutation of that myth and a recognition that the future we dreaded may already be upon us. Shults conceived of It Comes at Night after the death of his father, an alcoholic on whom the female protagonist of Krisha is partly based. Even if you weren’t aware of that autobiographical fact going in, it would soon become clear this is a movie obsessed with death and fathers: the existential inevitability of one, the psychic inescapability of the other. Though its themes are so dark they seem to call for the invention of a new color, It Comes at Night does offer a few glimpses of levity and affection amid the unremitting bleakness, especially when Travis eavesdrops on the newly arrived couple who, in contrast to his grim-faced, rifle-gripping parents, seem like the embodiment of young love. 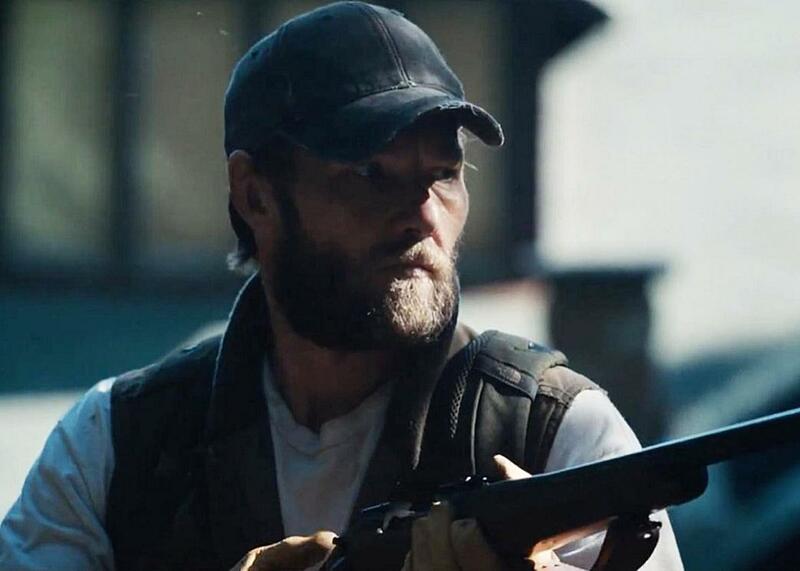 Toward the end, It Comes at Night’s horror elements—the obscure rumbles and mutterings in the hallway, the nightmares that seem at first to be really happening—start to give way to action-thriller questions: Who is and isn’t telling the truth? Who will outsmart whom? Where’s the key to the gun cabinet? A framed Pieter Bruegel print on the wall of Travis’ room—it’s The Triumph of Death, an apocalyptic panorama—is the subject of a disturbing montage near the beginning of the movie in which the camera dissolves in and out of parts of the painting, highlighting various horrifying details. (This scene is, again, an autobiographical touch: Shults has described staring in fascination at the Bruegel reproductions that hung in his childhood home.) At first thought, the director’s approach to showing human dereliction would seem to be very different from the Flemish master’s: Bruegel was a maximalist whose massively populated canvas provides a vista on the suffering of an entire continent while Shults is a minimalist whose point of view rarely ventures beyond the film’s single, claustrophobic location. And of course, Bruegel’s painting reimagines a real historical horror—he was alive for two major recurrences of the plague known as the Black Death—while Shults’ film imagines a possible future we can only hope never arrives. But both creators are attempting to look hard at the worst experiences the world has to offer while not losing their faith in humanity, and both of them—the one with a paintbrush and the one with a camera—are in total control of their art.